I am able to travel anywhere in the Southern Illinois area. If you are outside of this area, please contact me for possible arrangements. My service is on a reward basis, determined by you and normally based on monetary and/or sentimental value. I do have a call out fee of $30.00 to get me on site. If I have to drive more than a half hour, my call out fee will be more and is negotiable. The call out fee covers my gas and other expenses. I can perform searches on land, beaches, or in water up to five feet. Please advise me of any special or unique circumstances concerning the area where you believe you lost your item. If the area is on private property, please obtain permission for the search. I am retired from the federal government and the local school district. 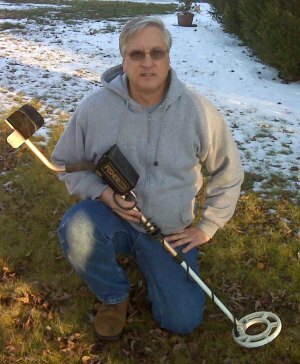 I have been involved in metal detecting for 25 years and along the way I have helped many people find valuable items they have lost. It has always been a pleasure to see the joyful faces of people who thought their treasured item was lost forever.